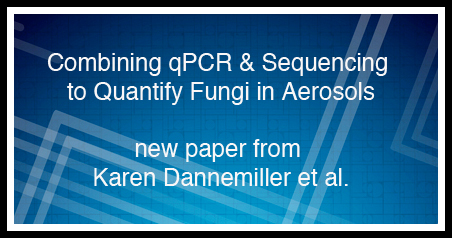 New paper of interest on combining qPCR & sequencing to quantify fungi in aerosols – microBEnet: the microbiology of the Built Environment network. Citation: Dannemiller, K. C., Lang-Yona, N., Yamamoto, N., Rudich, Y., & Peccia, J. (2013). Combining Real-Time PCR and Next-Generation DNA Sequencing to Provide Quantitative Comparisons of Fungal Aerosol Populations. Atmospheric Environment in Press. The abstract is copied below. Basically, they used a combination of 454 sequencing and qPCR and some careful calculations to measure absolute concentrations of fungi in aerosol samples. Not only is this of relevance to aerosol studies but it also presents a technique others could mimic when trying to estimate absolute concentrations of microbes in various samples. Abstract: We examined fungal communities associated with the PM10 mass of Rehovot, Israel outdoor air samples collected in the spring and fall seasons. Fungal communities were described by 454 pyrosequencing of the internal transcribed spacer (ITS) region of the fungal ribosomal RNA encoding gene. To allow for a more quantitative comparison of fungal exposure in humans, the relative abundance values of specific taxa were transformed to absolute concentrations through multiplying these values by the sample’s total fungal spore concentration (derived from universal fungal qPCR). Next, the sequencing-based absolute concentrations for Alternaria alternata, Cladosporium cladosporioides, Epicoccum nigrum, and Penicillium/Aspergillus spp. were compared to taxon-specific qPCR concentrations for A. alternata, C. cladosporioides, E. nigrum, and Penicillium/Aspergillus spp. derived from the same spring and fall aerosol samples. Results of these comparisons showed that the absolute concentration values generated from pyrosequencing were strongly associated with the concentration values derived from taxon-specific qPCR (for all four species, p<0.005, all R>0.70). The correlation coefficients were greater for species present in higher concentrations. Our microbial aerosol population analyses demonstrated that fungal diversity (number of fungal operational taxonomic units) was higher in the spring compared to the fall (p=0.02), and principal coordinate analysis showed distinct seasonal differences in taxa distribution (ANOSIM p=0.004). Among genera containing allergenic and/or pathogenic species, the absolute concentrations of Alternaria, Aspergillus, Fusarium, and Cladosporium were greater in the fall, while Cryptococcus, Penicillium, and Ulocladium concentrations were greater in the spring. The transformation of pyrosequencing fungal population relative abundance data to absolute concentrations can improve next-generation DNA sequencing-based quantitative aerosol exposure assessment.